The Gimcrack Stakes is one of many highlights of the Ebor meeting at York. Most of us are familiar with this important two-year-old contest but possibly know less about the celebrated thoroughbred that the race was named after. Gimcrack was foaled in 1760. He was by Cripple, a somewhat prejudicial sounding name for this stallion son of the Godolphin Arabian, out of Miss Elliot. Like both his sire and dam Gimcrack was a grey and even by the standard of the time he was only a small horse, measuring no more than 14 hands ¼. His first racecourse appearance was as a 4yo at Epsom in 1764 where he beat five opponents. He was unbeaten in seven races that year, mostly at distances of four or two miles, winning at a number of long abandoned minor racecourses such as Guilford, Winchester, Barnet and Reading. During his racing career Gimcrack had 6 different owners, these included William Wildman who bought him for ~£35 and sold him on to Lord Bolingbroke in 1765 for 800 guineas. Bolingbroke may have returned the favour by later advising Wildman to buy Eclipse, an even more legendary thoroughbred, at the Duke of Cumberland’s dispersal sale in 1765. Gimcrack was then bought by the Comte de Lauraguais, who sent him to France in 1766 where he ran a race against the clock over 22 ½ miles, which he ‘won’ by coming in under an hour. The owner won a considerable sum but was severely criticized for subjecting Gimcrack to such a harsh contest. The Dictator of the Turf and co-founder of the Derby Sir Charles Bunbury purchased Gimcrack in 1768. It was Bunbury’s wife Sarah (née Lennox) who famously described him as “the sweetest little horse there ever was”. Sarah herself was not so adorable to Sir Charles due to her well known reputation for gambling and adultery, their divorce was granted by an Act of Parliament in 1776. The final owner of Gimcrack was the enthusiastic turfite Lord Grosvenor, founder of Eaton Stud in Cheshire where over the following century many great champions, such as Touchstone, Bend Or and the unbeaten triple crown winner Ormonde, would be foaled. Gimcrack raced for 8 seasons in total, finally retiring at the age of 11 in 1771. Altogether Gimcrack won a total of 27 out of the 36 races he competed in, many at the major Newmarket meetings. Some turf writers claim he was not of the highest class, yet he met and beat almost all of the top racehorses of his day, usually conceding not only weight, but age as well. It was William Wildman who first commissioned George Stubbs, Britain’s greatest equine artist to paint the grey and Stubbs painted ‘Gimcrack with John Pratt Up’ for him. Stubbs went on to paint the horse a number of times and in 2011 ‘Gimcrack on Newmarket Heath, with a Trainer, a Stable-Lad, and a Jockey' by George Stubbs sold for £22.4 million at auction, making it the third most valuable Old Master ever sold. A second version of this painting hangs on the wall of the Jockey Club Rooms in Newmarket. ‘Gimcrack on Newmarket Heath, with a Trainer, a Stable-Lad, and a Jockey’ by George Stubbs, sold at Christie’s in 2011. Gimcrack retired to stud in 1772 but did not cover many mares. He did sire a few good horses including Grey Robin, who defeated Pot-8-os, and Medley an extremely handsome grey who won 12 races and was later exported to America. Medley proved to be a very successful stallion in Virginia siring many top class winners, and was later an outstanding broodmare sire in particular when his daughters were covered by Diomed. Another granddaughter sent to America produced Miller’s Damsel, the dam of American Eclipse. Gimcrack’s lack of appeal to breeders may be explained by his size and his somewhat unattractive appearance, his major assets being his toughness and courage rather than his looks. Gimcrack was though universally admired during his time, described by one devotee as "perhaps the first horse to carve himself a place in turf history by virtue of his charm". He was especially ‘beloved of York’ where Ye Anciente Fraternite of York Gimcracks, commonly known as the Gimcrack Club, was founded in 1776, named in his honour. Ironically Gimcrack was beaten in the only 2 races he ever contested at York. And of course Gimcrack is commemorated by the name of one of the most important races of the year for two-year-olds, the Group 2 Gimcrack stakes run over 6f in August at York. The race was first run in 1846 and has been won by a number of great horses including Blink Bonny, Bahram, Windy City, Mill Reef and more recently Rock Of Gibraltar. The winning owner of the Gimcrack Stakes is invited to give a speech at the annual Gimcrack Club dinner in December. 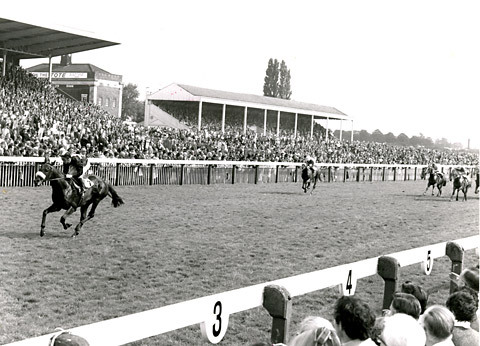 Mill Reef winning the 1970 Gimcrack Stakes. After his death Gimcrack was buried at Haughton Hall in Shifnal, Shropshire. There may have been faster and more talented racehorses in the 18th century than Gimcrack, his contemporary Eclipse and Flying Childers before them spring to mind, but few horses from that era or even since then have commanded such affection as this little grey. His name will live on through the race and club named in honour of him. A fitting tribute to such a popular and wonderful horse.